Honey bee hives will naturally produce their own queen, but it’s an imperfect system: sometimes the queen cell doesn’t take, or the queen dies (or is killed by bees who are still loyal to another queen’s pheromones), or the hive is not strong enough to wait a few weeks until its new queen emerges, mates, and begins to lay eggs. 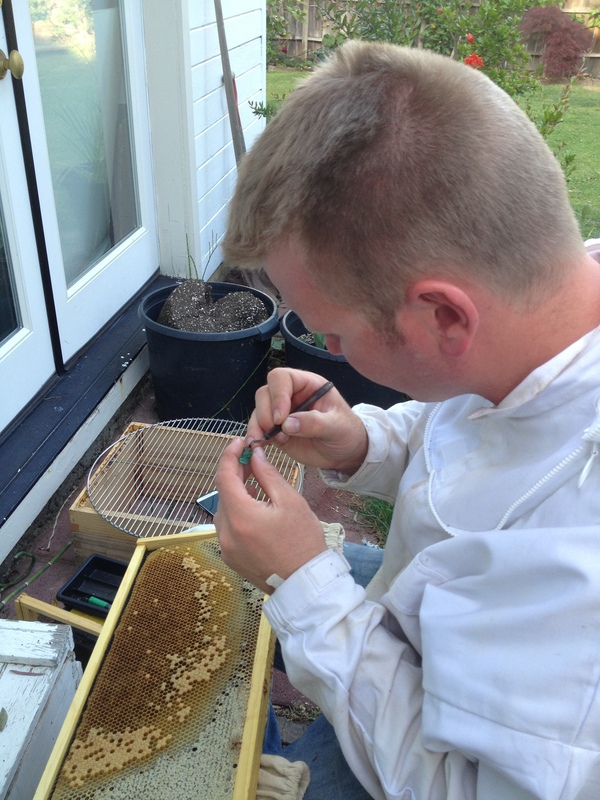 That’s why beekeepers often take matters into their own hands by breeding their own queens. Carson taught himself this tricky and delicate process last year, with mixed success – some of his queens made it, but most didn’t. When you consider the precision involved, including exact temperature and timing requirements at all stages of the process, it’s a miracle this ever works out! With last year’s experience under his belt, Carson is at it again. Here is is creating twenty queen cells. Fingers crossed that about half of them hatch… and that Carson’s timing is perfect so he can separate them before the first queen to emerge kills the rest! To find out more about the laborious and varied processes of breeding queens, you can read this detailed explanation.